Ter Doest abbey. Lissewege posesses one of Flander's most important medieval monuments: the barn of the former abbey of Ter Doest. 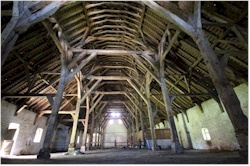 The monumental barn is the only remaining relic of the once rich and properous abbey. Built in the 13th century in bricks and measuring 56 by 21 by 16.50 m, it is the largest and oldest of its kind. Remarkable are the blind gothic window at the top sides. The interior consists of three aisles with oak pillars and roofing [more info]. Church of Our Lady Visitation. 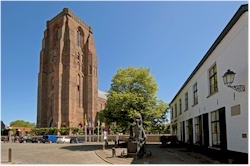 The symbol of the village of Lissewege is the church with its impressive flat tower which looks way oversized for such a small place. Towering high above the green polderlandscape, it can be seen from far away and it defenitely worth a visit. According to a legend, the church was built on the place where fishermen found a miracle statue of Mary [more info]. 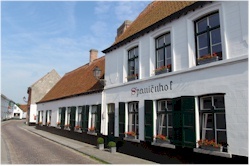 Spaniënhof. This complex (translated: court of Spain) dates back to the 16th century when it was a tavern/hostel that was used by the pilgrims who were on their way to Compostella. It remained a tavern up till today but during its life it was also a brewery. The complex consists of a house, a tavern, the former brewery (with malt tower) and stables. Huyze Roelandsloove. This house is one of the oldest houses in Lissewege. Alledgedly it dates back to the early 15th century. A commemorative plaque mentions the year 1429 and refers to its owner at that time being Roeland van Beukemaere, the lord of Uitkerke. Tavern De Valkenaere. This tavern was already mentioned in the 16th century. It was shortly used as the community hall of Lissewege and now resumed its old role as tavern. The old presbytery. The 19th century street facade hides an older part of the presbytery, which was built in the 17th century. Now it houses the tourist office and the museum of Saints.